These soaps and perfumes were sent by Julia for free. I am choosing to review them. All opinions are my own. 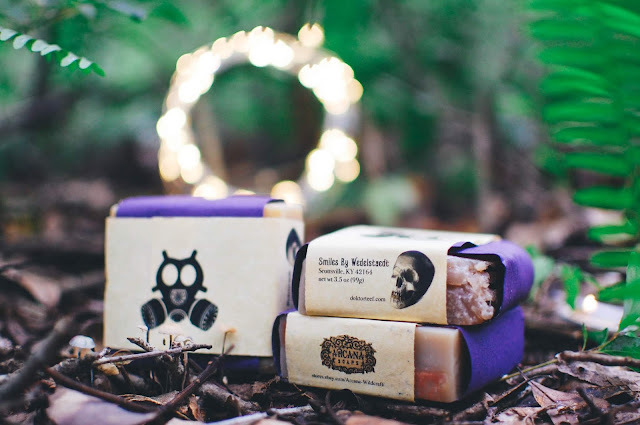 Julia from Arcana Wildcraft and Brooke from Smiles By Wedelstaedt make for a dream team when it comes to creating fragrances and body treats. When Brooke ran Villainess, her and Julia made amazing collaborations and it thrills me that they are still creating magic together. This particular magic resulted in the collection Dangerous Places which are inspired by locales that are shrouded in mystery and legend. 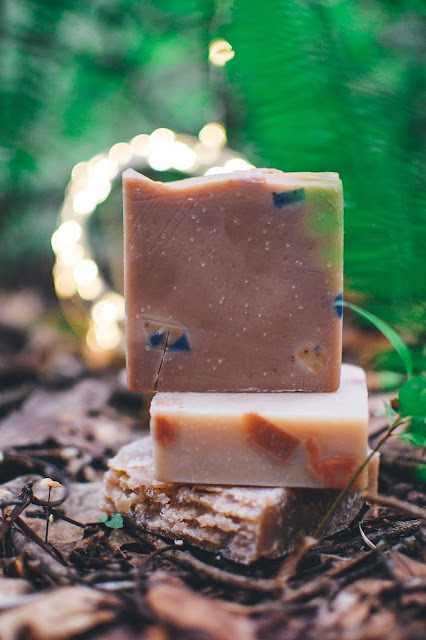 Brooke crafts decadent soaps using her own recipes and formulas with quality ingredients. They run $15 each and are cold processed with tons of decadent butters and oils such as palm oil, rice bran oil, coconut oil, castor seed oil, shea butter and mango butter. Silk is also in each soap for added shine, lather and smoothness. I will briefly describe the scents and focus more on the feel of the soaps since I will be talking about the perfumes they correspond with below. Death Valley and Raven Rock list the same ingredients on the label and they both feel extremely plush on the skin when showering with them. Death Valley has a subtle sweetness to its scent and lathers up beautifully. 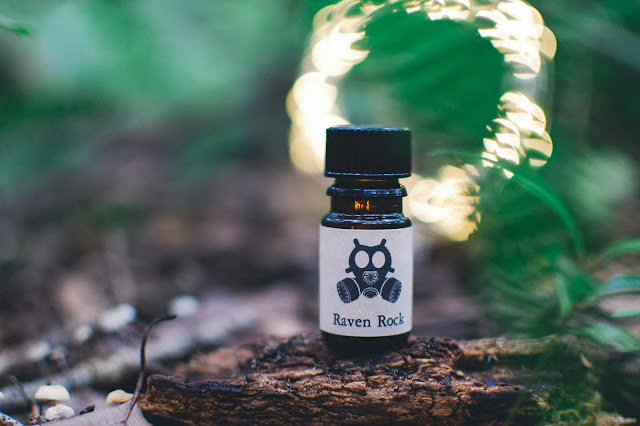 Raven Rock froths up in hues of indigo and slate with a deep rich scent. Both cut cleanly when chopping off slivers, they have a rubbery yet dense feel with flexibility. The lather produced from these two is thick and foamy and emollient. It slides on the skin with buttery ease like a hybrid of a bar of soap and a bar of lotion. Death Valley is smooth and satiny against the fingers and palms while Raven Rock has a little bit of texture. They rinse cleanly and leave no residue behind. Bermuda Triangle has added Irish moss granules, dulse granules and kelp granules. This soap is smooth like a stingray fin with small blue chunks and cream chunks that have tiny botanical pieces, these may be the granules? They are sporadically spread so I wouldn't really call this an exfoliating soap, but the texture is neat where the bits are located. This soap has a sweet tropical fragrance. It suds into a lather that bubbles rather than foams on my skin. It still feels emollient and rinses cleanly. Vatican Archives is augmented with honey. Vatican Archives has honey as a scent note so the added honey in the formula is pretty spectacular. 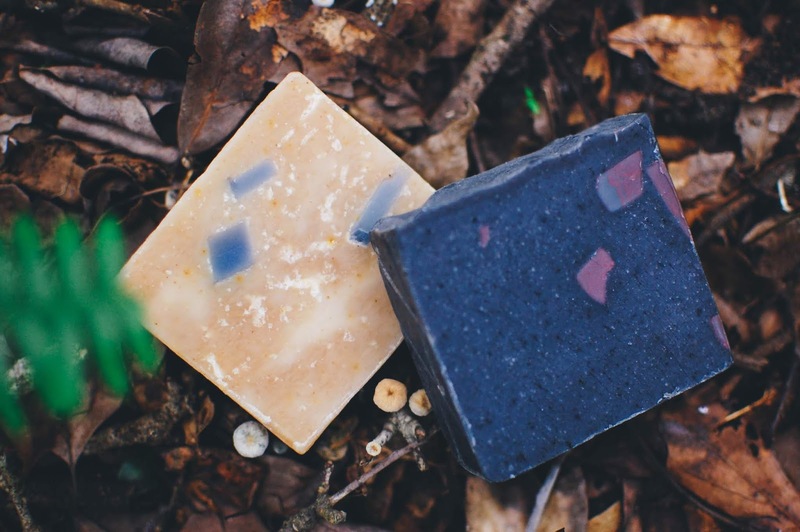 This soap is the bottom one in the photo above, you can see the rustic, primitive appearance of it. I enjoy a soap with character. The rough-spun feel of it in the hands is comforting. Rubbing it on the limbs produces that same viscous and frothy lather that feels nourishing on the skin. I used this on my face and it felt luxurious in its cushiony texture. The aroma mostly came across as honeyed parchment paper and it was lovely. 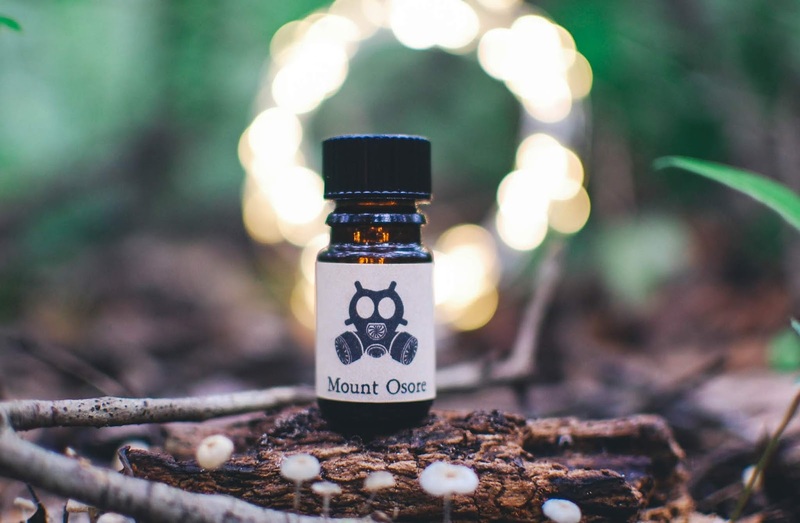 Mount Osore is tantalizing in soap form. 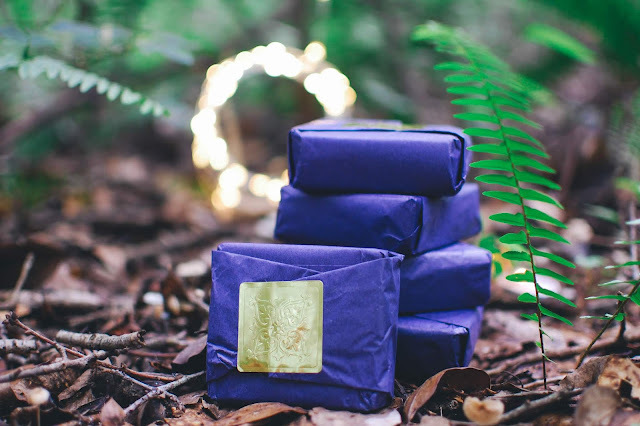 The smoky palo santo fragrance and the silken texture combine for a serene soaping experience. 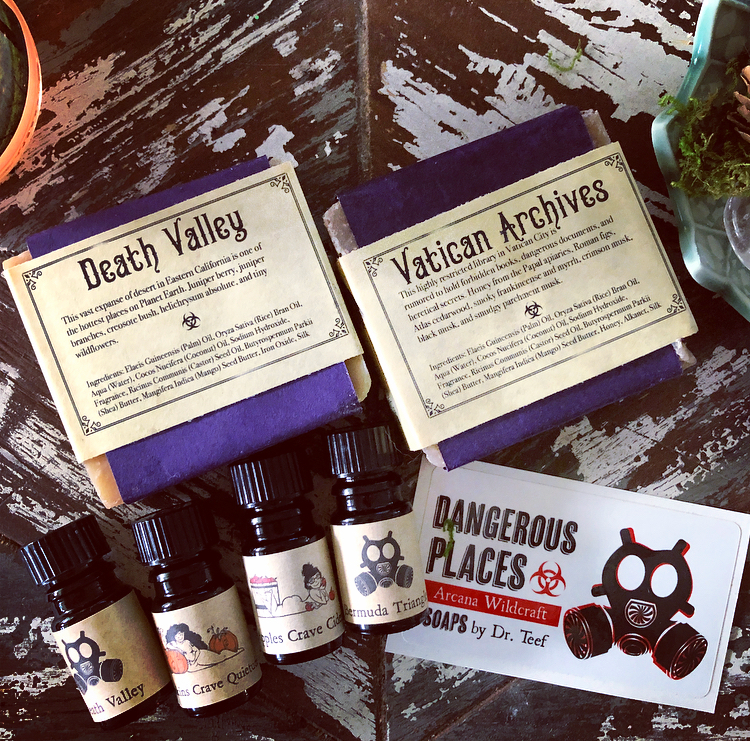 This soap along with the Vatican Archives and Raven Rock are my personal favorites from the set but all five of them are stellar. Death Valley- Notes: This vast expanse of desert in Eastern California is one of the hottest places on Planet Earth. Juniper berry, juniper branches, creosote bush, helichrysum absolute and tiny wildflowers. Heady immortelle and scaly juniper needles issue from the amber bottle. This is the scent I was most excited for upon this release. I have been watching Julia harvest and process the juniper by hand and knew it would result in something special. It has. Pressed onto the wrists, dry gin and juniper berries exhale their anhydrous spirits into the ether. Sprigs of herbal tea and dusty hay and camphorous creosote infuse the gin. As it settles the gin wears off and green herbs and florals open up their stems and leaves and pour out their essence. The scent gets fresher and more arid as it dries down. It ends like clean sun baked sand and bleached bones and branches. Bermuda Triangle- Notes: The Devil's Triangle in the North Atlantic has been the scene of mysterious disappearances for many decades. White coconut, ginger cakes, fresh ginger, red bananas, golden vetiver, creamy almond and cask-aged rum. From the bottle arises tropical treats of ripe spiced bananas and white coconut flesh. There is a soft undertone of earthiness from the vetiver. The coconut and vetiver combination bring the Black Sands accord to mind but this one is more sweet and mellow. Splashed onto the skin a waft of sweet almond cakes greets the nose. Bermuda quickly takes on the aged and earthy scent of rum casks freshly dug up from a smuggler's island. Clods of sweetgrass cling to the casks and coconut husks make for easy cups to hold the rum. The vetiver eventually ebbs away and the delectable aroma of softly spiced sweet cakes flows in. It is never what I would call a gourmand scent, however. A bit of the hay and sweetgrass and coconut husk lingers faintly within the sweetness. Raven Rock- Notes: Also known as the Underground Pentagon, this secret bunker in Pennsylvania is where U.S. leaders plan to wait out Armageddon. The green leafiness of the Blue Ridge Mountains with cherry blossoms, white tea and hints of basil, cilantro and dill weed. This is heavenly in the bottle. Delicately sweet sakura petals and mild herbs tickle the nose. A watery garden. Watered onto the wrists, glossy green basil leaves and feathered dill sprigs spring up. Their perfume is sweetened by pale honeyed tea. Pink cherry blossoms open up amid the tender dill and mellow tea. They yeild a sweet floral aroma that suggests a tranquil meadow of iris and sweet pea. This is truly a beautiful, beautiful fragrance. I am smitten by this herbaceous sylvan beauty. It dries down in a smooth amber musk. Mount Osore- Notes: Site of a Buddhist temple, legend has it that this active volcano in Japan also contains an entrance to the Land of the Dead. Dark red rose petals, Japanese amber, sooty palo santo and smoking nag champa incense. From the bottle snakes a cord of watery lotus and earthen palo santo. The palo santo possesses qualities of nicotine to my nose. Very interesting. Poured onto the wrists the palo santo wafts forth much more smoothly with its characteristic creaminess and almost minty coconut freshness. The white smoke darkens as the scent swirls further into the heart. A burning electrical spark ignites and blooms into what smells like ashes from a rose. I have never quite smelled a perfume such as this. It truly does have the emanation of danger. As the perfume settles the nag champa emerges and the burned rose departs, leaving a soothing serene experience. Vatican Archives- Notes: This highly restricted library in Vatican City is rumored to hold forbidden books, dangerous documents and heretical secrets. Honey from the Papal apiaries, Roman figs, Atlas cedarwood, smoky frankincense and myrrh, black musk and smudgy parchment musk. Unstoppering this elixir releases flickering shadows of blackness, as if slinking up from the chilled stones in the catacombs. Anointed on the skin, the black musky shadows retreat temporarily and honey from the lips of forbidden women drip into the scent, smoother than oil. Papery tendrils of shaved parchment mix with the mild nectar, the descent down into the secret archives is lined with bound vellum books, crumbling antique pages as fragile as moth wings. Their fragrance delicately perfumes the air along with the cedar hewn shelves and the specters of age old incense from visitors past. All these aromas merge into a holy trinity of skin musk that remains elusive and haunting, airy and ancient. This collection is hugely evocative of each dangerous place they are meant to convey. The soaps are divine and the perfumes are incredible. 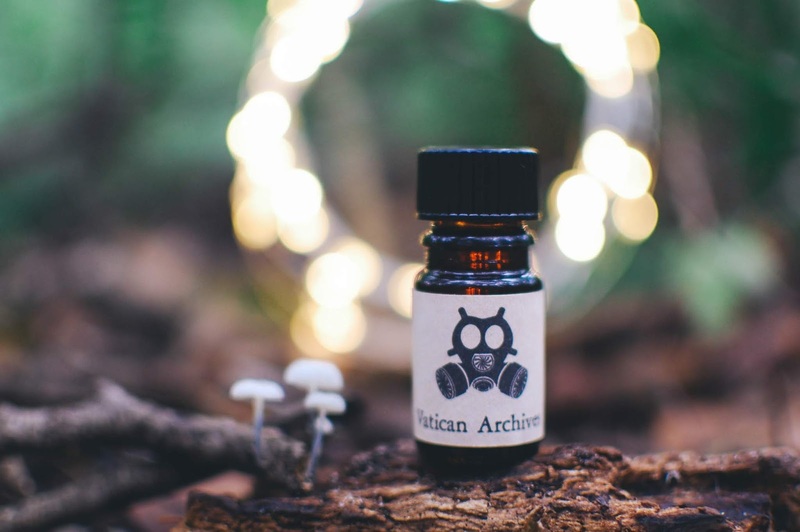 As I had previously purchased quite a few of these under my own steam, I am offering up a few of these as well as a few traditional Halloween Arcana scents in a giveaway. I am giving away my personal order I paid for since I ended up using the soaps and perfumes from Julia and kept these unused. 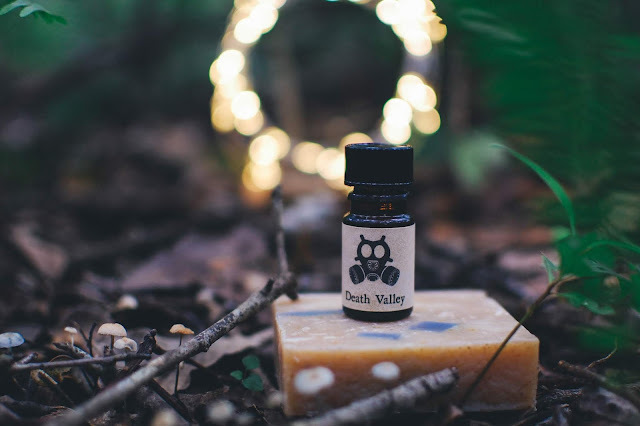 Two soaps (Vatican Archives and Death Valley) as well as perfumes in Death Valley, Pumpkins Crave Quietude, Apples Crave Cider and Bermuda Triangle along with a sticker. This is roughly $130 worth of amazing handcrafted product. To enter please leave a comment below with which of these dangerous places you would most like to visit. I would love unlimited access to the Vatican Archives. But it would also be cool to go to Raven Rock and see the top secret Pentagon bunker. And a trip to Japan is always welcome. I missed hiking Mount Fuji when I was there but I could make up for it with checking out Mount Osore. Please include your email address along with the comment. The winner will be randomly drawn on September 30th. Open to everyone. HOwwww could you ever pick a favorite from such neat places!? Weird fun fact about me, I find Volcanoes very fascinating and beautiful. It would be so neat to watch one from afar that wasn't endangering anyone, from a safe distance. Though I would have to say I would probably choose Raven Rock to take a peek inside the secret Pentagon bunker and see what they really have going on behind closed doors! My husband loves anything pirate related-pirate history and learning more of the Bermuda Triangle would be interesting too. Yeah? I have never seen an active volcano either but I bet it is scary yet beautiful. I agree! A safe distance!!! I do too Sarah! What a neat concept. I could see more locations following easily if she chose to make a part 2. Visiting the ancient places in Italy does appeal to me. The colosseum the catacombs, so much history. Me too! Japan houses some sacred and mysterious locations. I'd like to visit the Bermuda Triangle to get lost! Lol...well maybe for just a little bit...this scent sounds heavenly as do all of the others...thanks for the opportunity! Amazing giveaway!! My pick would be to visit Raven Rock! Secret government stuff has always peaked my interest. Thank you! Raven Rock and Area 51 would be cool. There just has to be so much cool stuff to learn from those locations. I agree!! Just being able to see and sniff and touch all the ancient manuscripts would be awe inspiring. That's such tough question! The knowledge and book-loving side of me would love to visit the archives and glean from them all I could. What mysteries must live there that few are privy to! On the other hand, I've always wanted to visit Japan and see everything there. How cool would it be to visit one of their sacred temples. I wonder what it would be like, being so close to a veil between the living and dead? Both sound incredible. Thanks for the giveaway! It really is!! I am with you on both choices. I know the Meiji Shrine is pretty touristy but it was still a sacred and neat place to visit. I wish I had visited more shrines and temples. Thank you! Death Valley sounds beautiful. I would not mind seeing it myself. While I was born in Tokyo (my parents were there for work in the 70s), I left before the age of 5, so I have very few memories. I would LOVE to go back to Japan, so Mount Osore is my choice! I have been to the Vatican, but not the Vatican Archives. They are a close second choice for me. How cool!! You should totally go back one day if you can. I love that you have been to the Vatican. I dream of a European trip. Italy would be on the list for sure. Thank you so much for your kind words Lindsay. <3 They mean a lot. I would be all about the Vatican Archives. I'm a book fiend in general, and forbidden books are the best kind. YES! Take me to the Restricted Section. Gorgeous review as usual! I would love to go see the Vatican and the archives would be amazing! Thank you Valerie! It would be amazing. I would love to discover every (forbidden?) knowledge in the vatican archives. Yep! Me too! It might take a lifetime but one glimpse would be neat. Like Kierstan I am terribly torn between choosing the Vatican Archives or Mt. Osore. I would really love to visit Japan- the food! the culture! the fact that everyone I've ever spoken to who has gone seems to have had an amazing time there- and a secret gateway to the underworld sounds like a vacation spot that would be just up my alley. But the Vatican Archives... all of the knowledge and secrets tucked away there... if there was any way for me to be granted access to that fiercely guarded hoard of knowledge there is just no way I could pass that up. So I guess my answer has to be the Vatican Archives but if I ever do make it to Japan I'll definitely be keeping Mt. Osore in mind. Thanks for such lovely reviews and the sweet giveaway opportunity! Also I don't know why it's taken me so long to look up the meaning of 'redolent' but now that I have omg what a perfect layered word choice. I am agreeing with everything you are saying! Secret books and Japanese adventures. Both are nearly perfect. This is such a tough pick! I'm definitely a lapsed Catholic by nature, which draws me to ... All these places, really, but the Vatican archives esoecially. 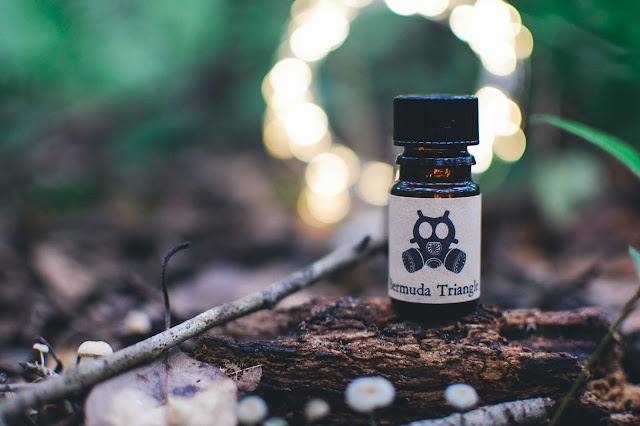 However, the Bermuda Triangle is one of those early memories I have of things laveled as "naughty and arcane" by my grandma, so I think that's the narrow winner. The Bermuda has always been a little scary to me as a child. I think learning about Amelia Earhart stuck with me. I am still fascinated by her tragedy. I am interested to hear what tales your grandma spun. I'm with you on the Vatican Archives! I want to poke around and read all the texts they have squirreled away in there. Yes! It has be incredible in there. For all the senses. These all sound so amazing, but I've always wanted to see the Vatican Archives. My husband tells me Death Valley is incredible, but I doubt I have the stamina for those kind of hikes. I'm really a book girl. Secret books. In secret places. Oooooo... secret books in secret places. You know how to ring my chimes. I agree. What a tough question! Awfully tempted by the Vatican Archives for pure curiosity but I think I’d really have to go with Mount Osore. I’ve never been to Japan and always wanted to go mainly for the tourist spots- food, culture, all the big stops but it sounds like the Buddhist temple would be quite a sight! You are welcome!! My pleasure. It is tough. Too many cool places and cool experiences to be had in life. A trip to Japan is worth it. The best travel experience of my life! I have been to Death Valley before, but I would love to see Vatican Archives! Really?! What was it like? Would you recommend it? As amazing as they all would be, it has to go to Mount Osore. The whole entrance to the land of the dead sounds pretty intense. The Bermuda Triangle! Though I might never make it back... email is kristikittelson(at)yahoo(dot)com! Vatican Archives would be a slice of heaven! Mt. Osborne has been on my travel list forever! I want to visit Tokyo and other large cities but I've also really wanted to see the more rural side of Japan deeply. I had never heard of it before this release. It sounds amazing. I spent about a week in Tokyo and I still feel like it wasn't enough time. Kyoto would be the next place I would want to go. I would love to see all the old manuscripts too. They seem like they would be works of art. I would love to visit the Vatican Achives. To look through old achives and the secrets so well kept will be a beautiful privilege. For some reason, the Bermuda Triangle and Death Valley have always fascinated and frightened me ever since I was a child. They're both still very intriguing, but I honestly don't know much about either. Thank you for the beyond generous giveaway, Julie! Such an awesome, beautiful collaboration and collection, with amazing hand crafted products, Julia and Brooke have executed and shared with us all. Good luck to all and I can't wait to see who's the lucky winner! Same for Bermuda Triangle for me! Very creepy. But Japan and the Vatican would be my picks. Japan is utterly awesome. You are welcome! Thank you for taking the time to read my blog and even more so for being my friend. I'm very interested in visiting Chernobyl, actually. Chernobyl... now what would that smell like? That's one heck of a choice to make--the Vatican Archives sound incredible, but I think I would choose Mount Osore. It is. It is. But one can dream right? Love my bar of Mt Osore and how the event lingers on my skin unlike any soap I have tried! But I am big on the desert and feel spiritually at home at many parts of it, so Death Valley it will be! Isn't it amazing soap?! I am really happy to have it. The Death Valley soap is fabulous too. I wouldn't mind seeing it myself. As an archivist/info science professional, my answer would also be the Vatican Archives! That would be right up your alley! I bet it is the most organized collection around. See, I had been doing good and was going to slide by without having to try any of these scents. Now there's at least 2 that I must at least sniff to see if I need in my life. Haha. As far as where I'd want to go, I'm torn. I'd have to say I'd either want to go to the Vatican Archives or Raven Rock. Both hold secrets that hardly anyone will ever know... I want to knooooow. Haha. Hahahahaa! I know the feeling sometimes! I try to not look too closely if I know that I should be behaving. But hey! Can't beat a free giveaway, right? Raven Rock secrets would be super cool to find out. The books and the Japanese scenery are my two weaknesses too. I wonder what secrets could be there too. You are welcome! Thank you for stopping by! The most exclusive library in the world. <3 I know I want to browse. I always enjoy reading your blog so much! Your reviews are so wonderfully descriptive, and these are no exception. Of the dangerous places, I would choose to visit Mount Osore. I lived and traveled extensively in China, but never made it to Japan. My e-mail address is petap888@yahoo.com. Thank you so much for doing this extremely kind and generous giveaway! Thank you so much!! That means a lot to me. China is a place I would like to visit one day. Walk the Great Wall. Welcome Yorrick!! Mount Osore does sound like a mystical magical getaway. I feel the same way in the mountains. I could really use an island vacation right about now so I have to go with a visit to the Bermuda Triangle. But I would also take Japan, if anyone was handing out trips. ;) lensideout@gmail.com thanks for the contest! I agree. I think it would awesome to explore such ancient and hidden places. Whoa! Raven Rock sounds so interesting. I'm so curious, is the dill note strong, or does it just feel 'green'? Hey Megan!! Welcome! xoxo The dill note is obvious for a brief moment but then just leans a greenness overall. I normally don't do crazy herbal scents but this one is really lovely. LOL! If I could stay in Japan for any length of time again I absolutely would. Such a cool place.